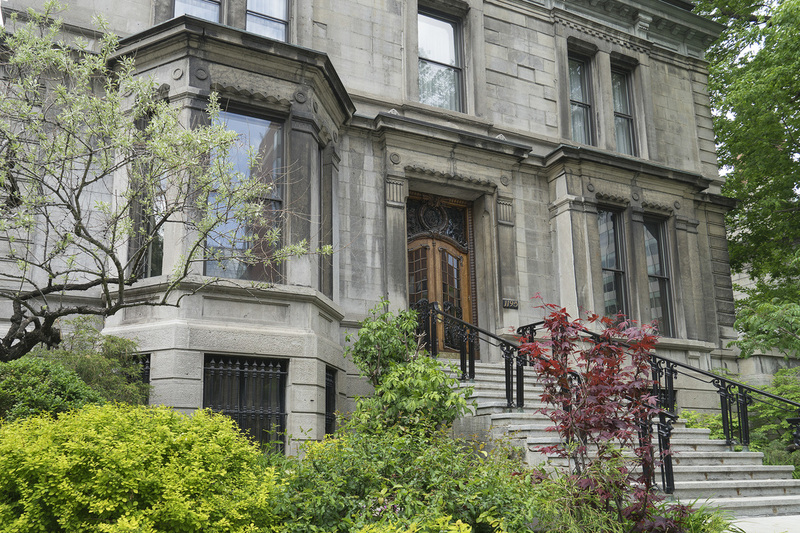 tIn early January 2016, The Irish Protestant Benevolent Society (IPBS) moved from 5165 Sherbrooke St. West to the historic Louis-Joseph Forget House at 1195 Sherbrooke Street West, Montreal. ​The Forget House serves as the administrative offices for the Macdonald Stewart Foundation and to house not-for-profit organizations including the St. Andrew's Society and the Irish Protestant Benevolent Society. The Macdonald Steward Foundation is a Canadian non-profit organization established in 1974. The Foundation is active in the areas of education, medicine, culture and heritage. ​A grande dame from the Golden Square Mile. The Louis-Joseph Forget House, c 1884. 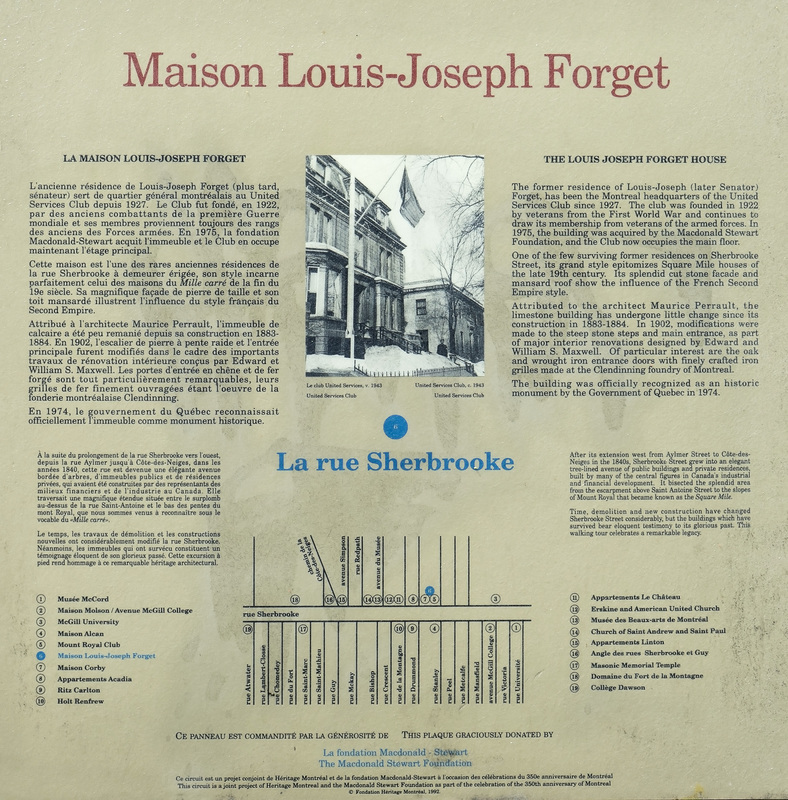 Designated as a historic monument by the Government of Quebec in 1974. The historic monument plaque in front of the Forget House. 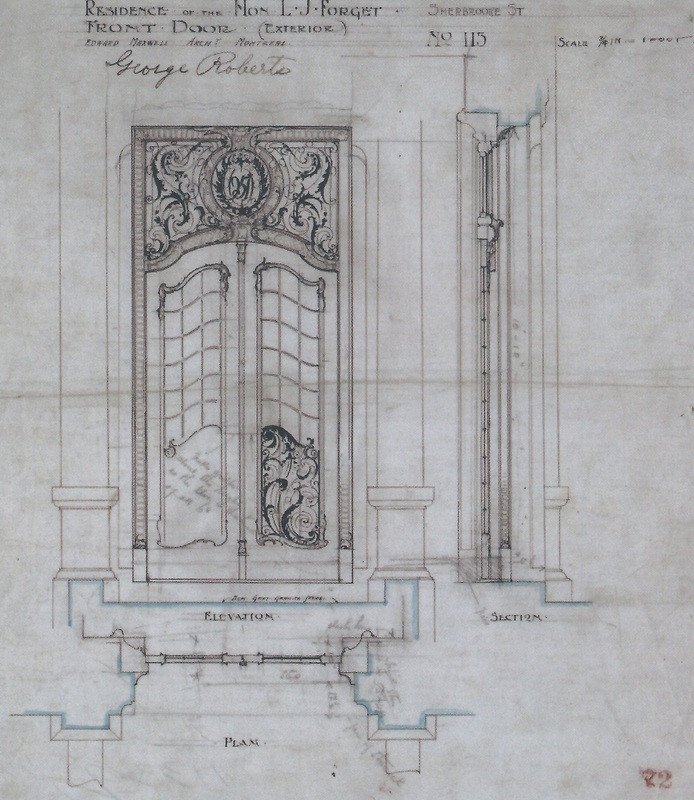 Maxwell brothers' 1902 architectural drawing of the front door. The sinuously curved grillwork was fabricated at the Clendinneng Foundry in Montreal. Source: Booklet published by the Macdonald Stewart Foundation. 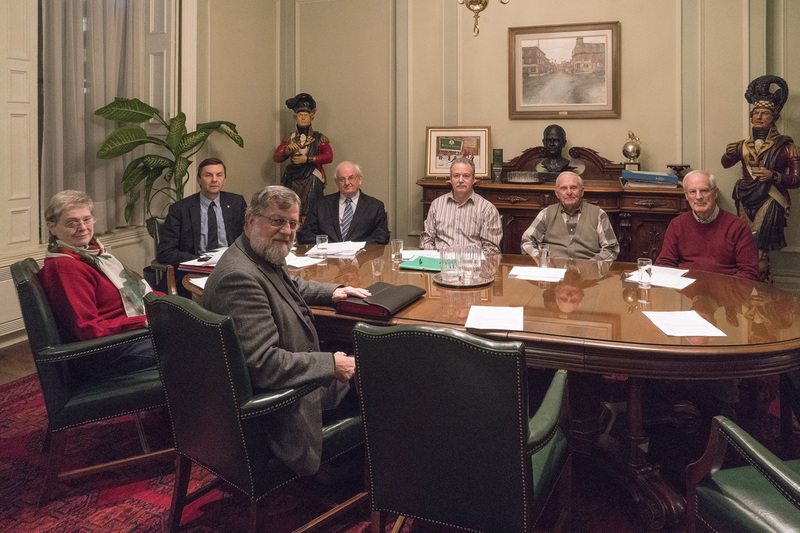 The Clendinneng panel was one of 36 panels on individual Irish immigrants that was displayed in the Embassy of Ireland's exhibit on: "The Irish Diaspora in Canada: A History" held in Ottawa in August, 2017. William Clendinneng: A founding member of the Irish Protestant Society and its President in 1875. Irish Tapestry of coloured silk - four by five feet - with a pattern of intermingling roses, shamrocks and thistles (symbols of three of Canada's founding peoples) and an outer border of maple leaves. "I have been pondering your interesting suggestion about writing a history of the Irish Protestant Benevolent Society. The more I look into it, the more fascinating, important and, indeed, exciting the idea becomes. It could so easily and naturally be broadened to include not only a history of the Society as such but a history of the contribution of the Irish Protestants to the life and development of Montreal, and even of Canada. 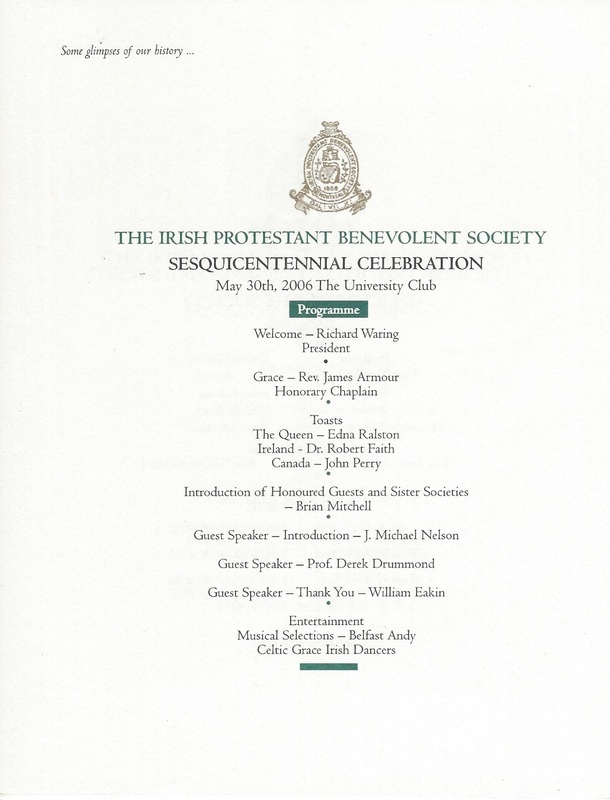 The two themes would easily become one, because of the astonishing list of eminent Irish Protestants who have been connected with the Society and its work. The value of such a history could be very real, and it could also be something of an historical revelation. Almost nothing has ever been written about the contribution of the Irish Protestants. The role of the Irish Catholics has been extensively covered, as has the role of other racial elements, such as the Scots, the English, the Jews, and others. But the Irish Protestants have never received the recognition that is their due. Such a history as this may help to fill the gap. It would also have an interest for readers beyond those concerned with the Society itself." 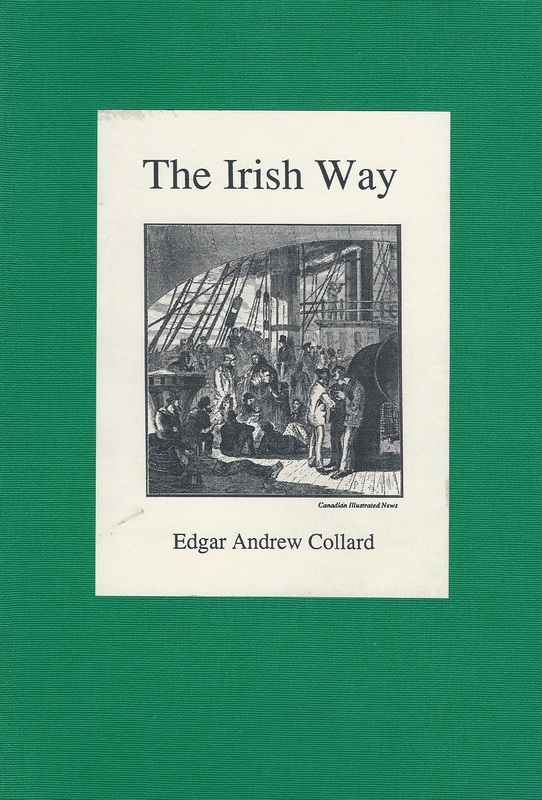 This response inspired the council to commission him to undertake the work that led to the book "The Irish Way: The History of the Irish Protestant Benevolent Society", now it its third printing (ISBN 0-9695771-2-5). Copyright 1992. Hardcover out of print. Softcover reprints, 158 pages. Please, contact the IPBS to purchase a copy. Cost: $15. *Note: Edgar Andrew Collard, CM was a journalist and historian, best known for his Montreal Gazette column "All Our Yesterdays". He was born in 1911 in Montreal and died in 2000 in Ottawa. He was a IPBS member. We're Irish yet! We're Irish yet! Again, in 2015, the IPBS gave a donation to sponsor the supper and to help serve a meal at the Old Brewery Mission. 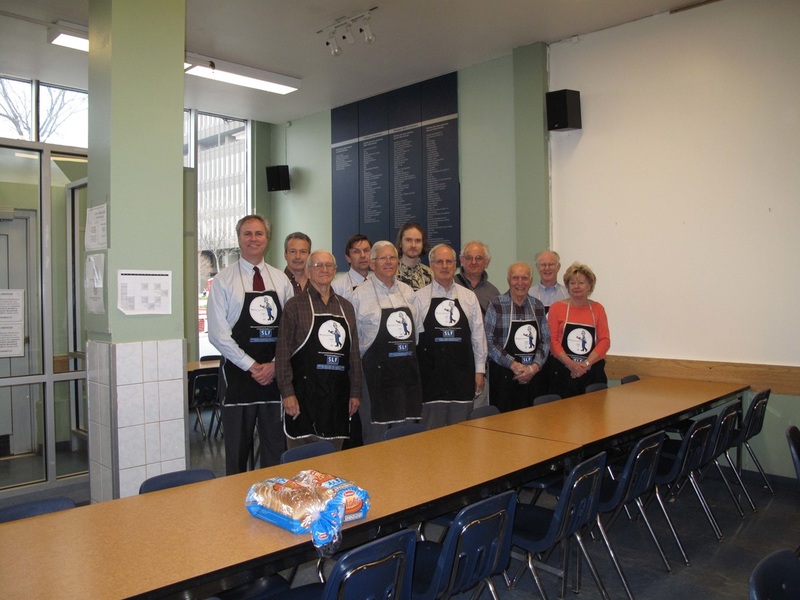 On hand in 2015 to serve the supper on Monday, March 30th were Robert Ouellette, Tony Wait, Rachel Ouellette and Mike Nelson. IPBS Council members about to serve dinner at the Old Brewery Mission, April 19, 2010. The Irish Commemorative Stone (also known as the Black Rock) is a monument in Montreal, Quebec commemorating the deaths of 6,000 Irish immigrants to Canada during the famine immigration. Officially named the Irish Commemorative Stone, it is more commonly known as the Black Rock and also has been referred to as the Ship Fever Monument. 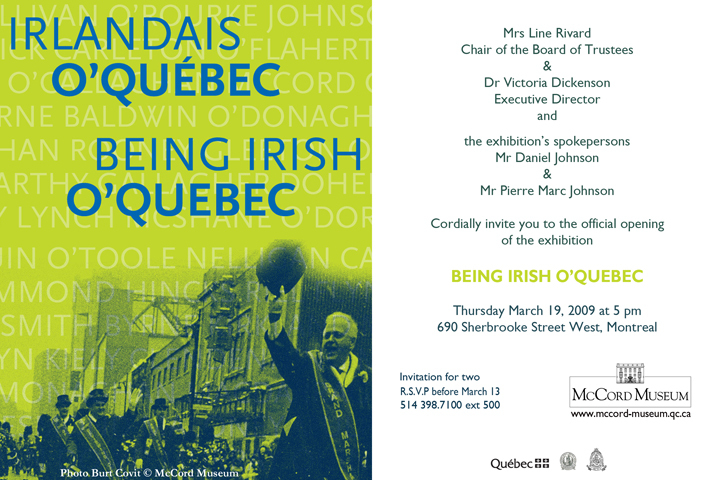 The McCord Musuem's exhibition Being Irish O'Quebec opened on March 20, 1009. It explored the integration of Irish immigrants and their contribution to the social, cultural, political and economic fabric of Quebec from the era of New France to today. 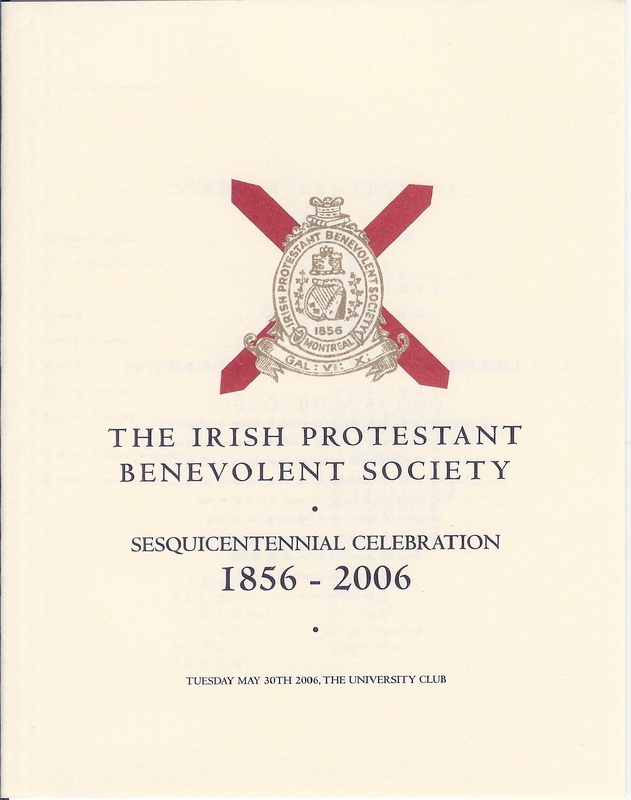 The exhibition was jointly sponsored by the Irish Protestant Benevolent Society and the St. Patrick Society. 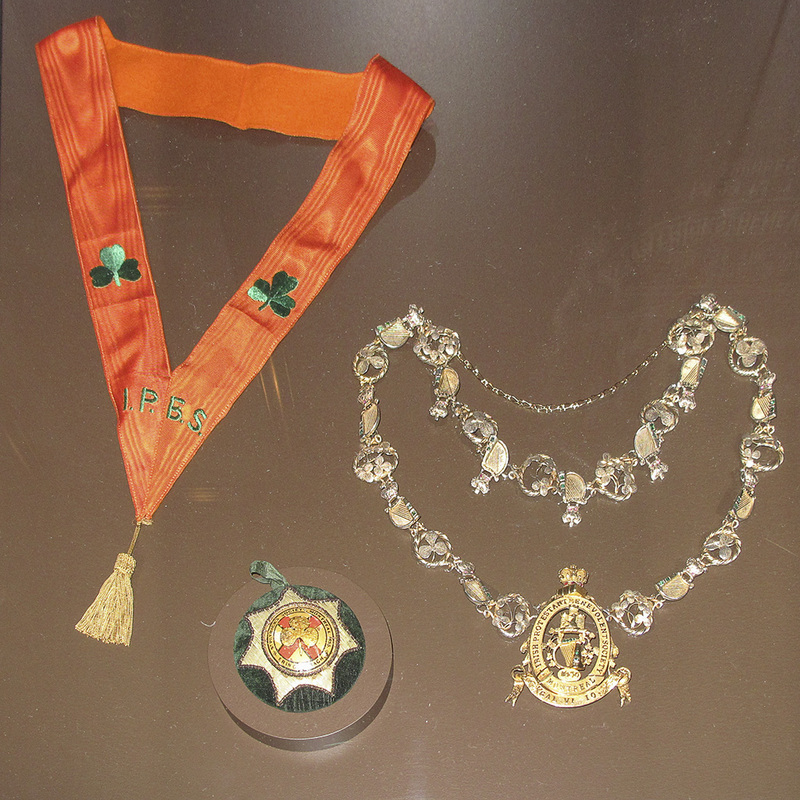 These two societies are the longest established and most representative organizations in the Irish Community in Quebec. The exhibition was of historical and cultural importance to the Irish diaspora in Quebec, one of the earliest and largest in Canada. Mount Royal Cemetery, Montreal, founded in 1852. - One of the oldest rural cemeteries in North America and a tremendous historical treasure. In the middle of the 1800s, the cemeteries located downtown Montreal needed space desperately. Concerned with epidemics and public health issues, these cemeteries had to be developed elsewhere. ​The Protestant community of Montreal purchased a tract of land (155 acres) on Mount Royal in 1847. There was no precedent in Canada for the design of such a large extent of land so the corporation turned to American planners for models of the rural cemetery fashioned after Pere Lachaise. These planners had been designing picturesque landscapes in cemeteries since 1831, when Mount Auburn Cemetery was created in Boston. J.C. Sydney, surveyor and civil engineer, was commissioned to design the Mount Royal Cemetery. Sydney was said to be a follower of Andrew Jackson Downing, who had been the corporation's first choice, but who died suddenly in 1852. The first burial in the cemetery was Rev. William Squire, a Methodist minister, on October 19, 1852. In 1862, the entrance gates were built in the early English Gothic style of architecture. Of interest were the iron gates made at the Wm. Clendinneng and Wm. Rodden foundry of Montreal. Both men were among the early members of the IPBS. 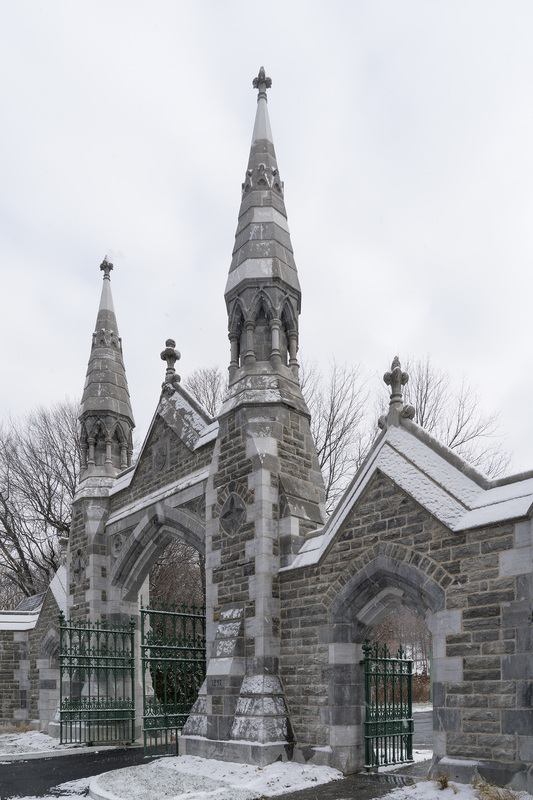 Mount Royal Cemetery's Imposing Gate in 2015. From its inception, the Society paid the costs of burying destitute Protestant Irish in the Free Ground of the Mount Royal Cemetery. In 1871, the trustees of the Mount Royal Cemetery offered the society a lot at "half price"; over the next years, the trustees struggled with the society over location of its lot, forcing them to locate in the charity section. Finally, in 1886, the society agreed to pay $250 for a thousand square-foot lot, and this was enlarged again in 1897. 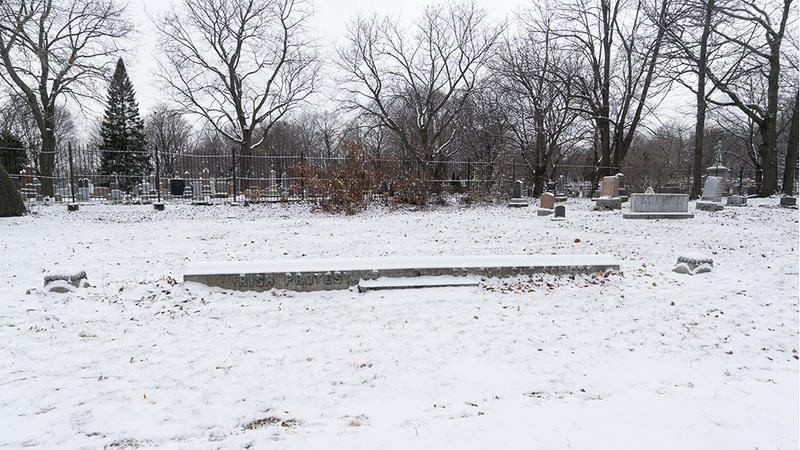 As part of the sales, the cemetery agreed to provide free interments and perpetual care of the site. The lot was subsequently graded, levelled, sodded, and marked by stone copings. Responding to protests concerning unmarked graves, the society began providing identical headstones for all graves. In a typical year such as 1888, the society provided the funeral and burial expenses for seven people. IPBS Lot, Section G. 390. On either side are the Young Men's Christian Association and the Montreal Protestant Homes lots. 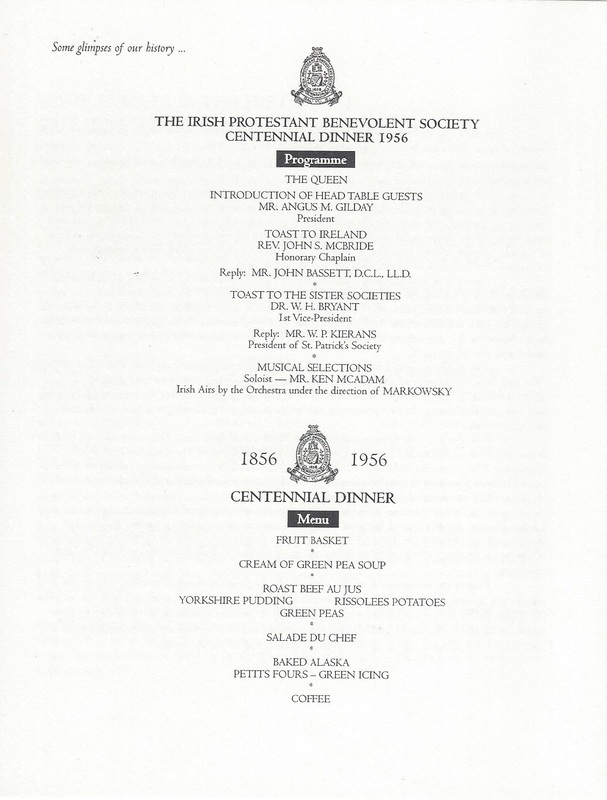 Montreal - The Irish Protestant Benevolent Society Picnic at St. Helen's Island. The Boys Race Through Flour Barrels, September 5, 1874. 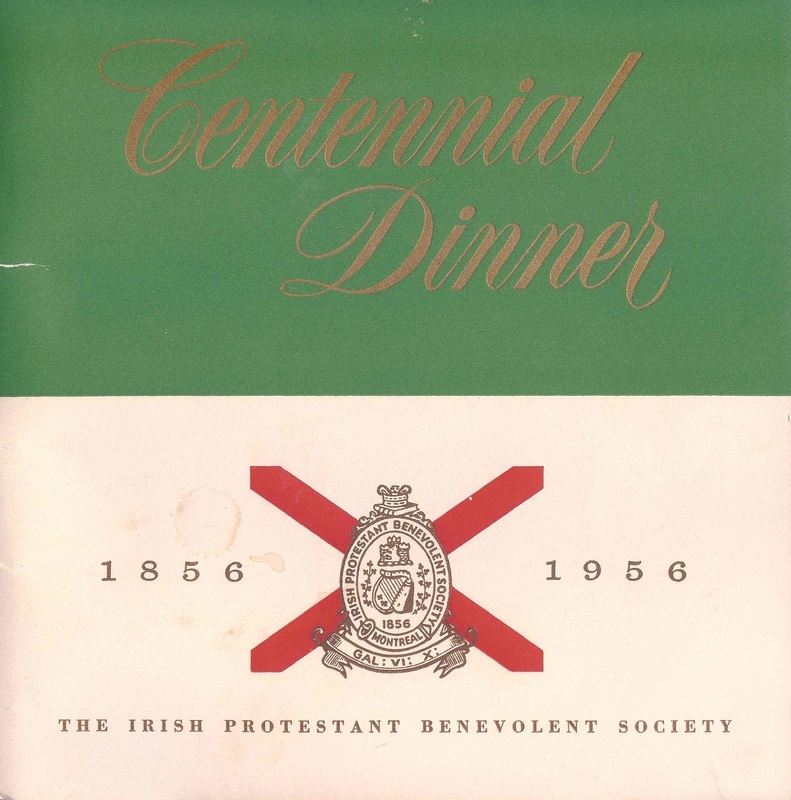 Many early meetings of the Irish Protestant Benevolent Society also took place at the old St. James Street Methodist Church. 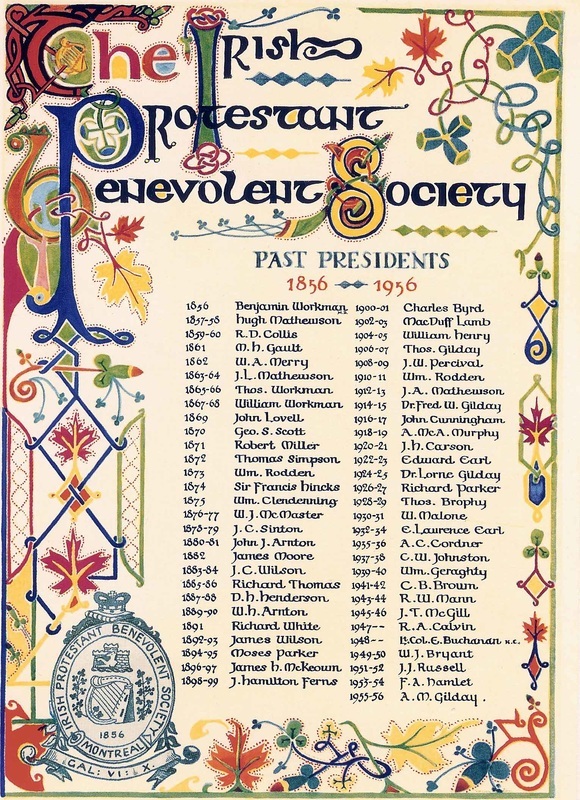 Given St. James' position as the leading Methodist church in the city, it is not therefore surprising that prominent members of Montreal's Irish Protestant community were church members, including Hugh Mathewson, George Armstrong, Richard Holland, and William Clendinneng, all of whom had participated in the creation of the Irish Protestant Benevolent Society in 1856*. These individuals all apper on the 1887-1888 membership list of the St. James Methodist Church. *Source: Montreal 1535-1914: Under British Rule 1760-1914, Vol. 11, page 386. By William Henry Alterton. A article on the Canadian Irish Regiments in the U.K. magazine, The Armourer of September/October 2012 (see below) provides an excellent history of Irish fighting units in Canada from the first unit formed in 1837 up to the present. 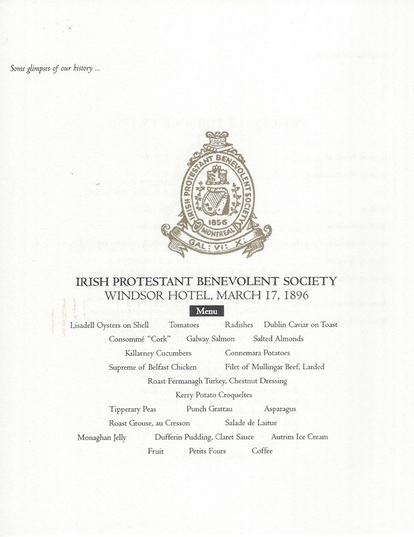 Irish Units formed in Montreal and role of the Irish Protestant Benevolent Society. During WW 1, the leaders of the Irish community of Montreal continually exhorted their compatriots to enlist for this just war. And this they did. In 1915, the Irish Canadian Rangers formed for home defence, but provided many men for the Canadian Expeditionary Force (CEF), forming the 199th Battalion and "C" company of the 60th Battalion. The rate of recruitment for "C" Company matched that of the Victoria Rifles, Grenadier Guards, and the Westmount Rifles, three predominately Anglo-Protestant regiments in Montreal raising companies for the CEF. The Duchess of Connaught's Own Irish Canadian Rangers Battalion. The experience in raising a unit for "C" Company convinced the leadership of the Irish-Catholic community of Montreal in late 1915 to raise a battalion for service in the CEF. Authorization was granted by the Canadian government in February 1916 for the 199th Overseas Battalion, Irish Canadian Rangers, to be formed. The 199th was designed to be a non-sectarian Irish-Canadian battalion. Indeed, a "monster demonstration" was held at Windsor Hall by both the St. Patrick's Society and the Irish Protestant Benevolent Society in support of the 199th's recruitment drive. The non-sectarianism of the 199th can be seen in one of its first recruitment posters (see opposite), which shows a map of all of Ireland, with the four provinces identified and the text "All in One" across the top. In 1917 they received a Royal patron, H.R.H. The Duchess of Connaught. This caused the battalion to be re-designated 199th (The Duchess of Connaught's Own Irish Canadian Rangers.). The regiment was dissolved in 1919 and disbanded in 1936. ​Today, the only active Irish regiment in the Canadian army, is the 2nd battalion (militia), Irish Regiment of Canada, stationed in Sudbury, Ontario. Recruitment poster for the 199th Overseas Battalion, Irish Canadian Rangers, 1916. Credit: Library and Archives Canada, Acc.No. 1983-28-888. 199th Battalion C.E.F. Enlistment Poster, 1916. Badge of the Irish Regiment of Canada. "FIOR GO BAS" - "Faithful unto Death"
The Irish regiment was originally founded in 1915 with headquarters in Toronto. The modern incarnation was formed in Sudbury in 1965 by the conversation of the 58th Field Artillery Regiment, RCA. In 1931 they became the only kilted Irish Regiment in the world with the adoption of their own unique tartan often called "O'Saffron" designed by Thomas Gordon Ltd. of Glasgow. (Irish regiments in the British Army utilize kilted pipers wearing a solid-coloured saffron kilt.). They also share the caubeen headers common to other Irish regiments. Stained Glass Details from the War Memorial Window commissioned by Prince Arthur, the Duke of Connaught, Governor General of Canada (1911- 1916), in memory of his staff lost during WW1. Unveiled by the Prince of Wales, the future King Edward V111, in 1919, Ottawa. By Irish Artist, Wilhelmina Geddes, 1887-1955. Princess Patricia, who died in 1974, was the widely popular daughter of the Duke of Connaught. Nowadays, Patricia is best known as the sponsor for the Princess Patricia's Canadian Light Infantry.